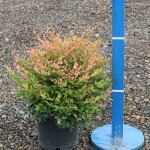 A dense compact shrub with an ascending growth habit which gives the plant an upward reaching appearance. 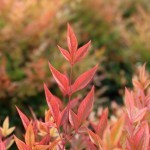 New leaves emerge bronze and mature to blue-green in summer and bright red in winter. It has small white flower spikes in the spring. Prefers full sun to some shade and moist soils. Useful as an informal hedge.